American politician, born at New Lisbon (now Lisbon) Columbiana county, Ohio, on the 24th of September 1837. In 1852 he removed with his father to Cleveland, where the latter established himself in the wholesale grocery business, and the son received his education in the public schools of that city, and at the Western Reserve University. Leaving college before the completion of his course, he became associated with his father in business, and on his father's death (1862) became a member of the firm. In 1867 he entered into partnership with his father-in-law, Daniel P. Rhodes, in the coal and iron business. It was largely due to Hanna's progressive methods that the business of the firm, which became M. A. Hanna & Company in 1877, was extended to include the ownership of a fleet of lake steamships constructed in their own shipyards, and the control and operation of valuable coal and iron mines. Subsequently he became largely interested in street railway properties in Cleveland and elsewhere, and in various banking institutions. In early life he had little time for politics, but after 1880 he became prominent in the affairs of the Republican party in Cleveland, and in 1884 and 1888 was a delegate to the Republican National Convention. in the latter year being associated with William McKinley in the management of the John Sherman canvass. 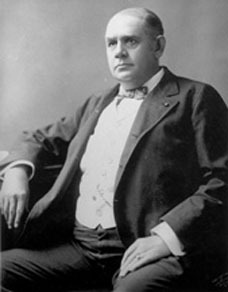 It was not, however, until 1896, when he personally managed the canvass that resulted in securing the Republican presidential nomination for William McKinley at the St. Louis Convention (at which he was a delegate), that he became known throughout the United States as a political manager of great adroitness, tact and resourcefulness. Subsequently he became chairman of the Republican National Committee, and managed with consummate skill the campaign of 1896 against William Jennings Bryan and "free-silver." In March 1897 he was appointed, by Governor Asa S. Bushnell (1834-1904) United States senator from Ohio, to succeed John Sherman. In the senate, to which in January 1898 he was elected for the short term ending on the 3rd of March 1899 and for the succeeding full term, he took little part in the debates, but was recognized as one of the principal advisers of the McKinley administration, and his influence was large in consequence. Apart from politics he took a deep and active interest in the problems of capital and labor, was one of the organizers (1901) and the first president of the National Civic Federation, whose purpose was to solve social and industrial problems, and in December 1901 became chairman of a permanent board of conciliation and arbitration established by the Federation. After President Theodore Roosevelt's policies became defined, Senator Hanna came to be regarded as the leader of the conservative branch of the Republican party and a possible presidential candidate in 1904. He died at Washington on the 15th of February 1904.